Five years ago, with no farming experience, Pierre Sleiman founded Go Green Agriculture. Today, the Encinitas, California company is one of the largest organic hydroponic operations in the United States. Go Green Agriculture, last featured in Seedstock here, grows a variety of certified organic crops hydroponically in its five-acre greenhouse. They include Butter Lettuce, Red Salanova lettuce, basil, and watercress. Not only was Sleiman embarking on a new adventure when starting Go Green Agriculture — he was also leading the charge in large-scale hydroponics. Because there was a lack of established standards and best practices to guide organic hydroponics farmers, Sleiman became involved in the regulatory side of things by lobbying USDA and other organizations. “USDA has relatively few regulations for hydroponics,” he says. In addition to putting hydroponics on USDA’s radar, his lobbying efforts garnered some unexpected results. Last year, he was recognized by President Barack Obama at The White House as one of 16 Agriculture Champions of Change. Also last year, California Governor Jerry Brown appointed Sleiman to a spot on the 22nd Agriculture District Board of Directors. 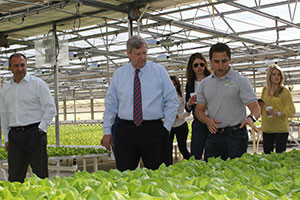 And in 2014, Go Green Agriculture became the first hydroponic farm to be visited by a USDA Secretary, as Secretary of Agriculture Tom Vilsack came out to the facility that year. Besides working as an ambassador for the growing hydroponics industry, Sleiman has also worked hard on spearheading technological innovations. All crops grown by Go Green Agriculture are organically-certified and grown hydroponically. Crops at the Encinitas facility are planted and harvested weekly, every week of the year. They are delivered locally, within hours of harvest. Plants inside the hydroponics greenhouse grow three feet above the ground—this eliminates the possibility of contamination via water runoff. Additionally, every aspect of the process is controlled (temperature, light, shade, air circulation, etc.) to ensure that the plants can thrive. This attention to detail has led to positive results. Go Green Agriculture has doubled in size every year since its founding, and now produces 500,000 head of lettuce per month in five acres of greenhouse space. It sells produce to San Diego area Costco stores, Whole Foods Market locations in Los Angeles and San Francisco, and 300 Safeway stores on the West Coast. Go Green Agriculture is also in partnership with Tender Greens, a West Coast-based restaurant chain that values slow, local and quality food. Tender Greens is eyeing its first expansion outside the West Coast (New York City), and Go Green Agriculture plans to follow (Tender Greens won’t want to ship produce across the country). But Go Green Agriculture’s next location will be in northern California, at the backdoor of numerous major distribution centers. Even though Go Green Agriculture has been making a profit for a couple of years, for a while it was a struggle. He also knows he would not be where he is now without the support of San Diego County Farm Bureau (he serves on its board of directors) and California Farm Bureau. Knowing he needed to sharpen his skillset, Sleiman participated in a one-year leadership training program through California Farm Bureau, and he earned his MBA from the Rady School of Management at the University of California, San Diego. It was at the Rady School where he met some of Go Green Agriculture’s current investors. Sleiman will give the keynote address at Seedstock’s upcoming conference, Innovation and the Rise of Local Food, in San Diego on November 3-4, 2015. He will share how Go Green Agriculture grew from humble beginnings (his college dorm room) to the largest in the United States. Also, he will paint a picture of the current state of the hydroponics industry, and will share insights such as grant opportunities and the venture capitalists’ points of view regarding hydroponics. “There are lots of opportunities out there,” he says. Speaking at the upcoming Seedstock Conference is just another way for Sleiman to continue his quest of educating people on the value and importance of hydroponics. “From a consumer perspective, people are more aware of hydroponics, which they value because of the food safety component,” he says.